Special Containment Procedures: SCP-1978 is to be contained at Site 17 in a locked room 4 m x 1 m x 1 m. At no time is a system of running water to be connected to the object without prior O5 approval. Any and all testing using SCP-1978 involving live subjects must receive O5 approval, must be extensively documented, and must be backed up to off-site locations before and after testing. All computer records of testing using the object must be stored off-site at least 1750 km from Site 17, and any systems containing such records must be protected against known reality altering events, to the extent the Foundation is able. At no time are personnel or other human subjects without officially documented records of violence allowed to enter the cubicle containing the object and testing apparatus. No approved human test subjects are to be permitted to use the functions of SCP-1978 more than two consecutive times without first being allowed to commit a violent act. A periodic administrative audit of the backup site will be performed by personnel attached to O5 on a monthly basis to ensure satisfactory execution of data handling. Additional Containment Procedures as of 31/██/2███: O5 council further requires that multiple copies of the testing logs from the object be kept at other sites around the world (See Addendum-1978-B). Description: SCP-1978 is a shower cubicle conforming to mid-1960's style, and containing components manufactured by █████████, Inc, as part of the ████ product line. 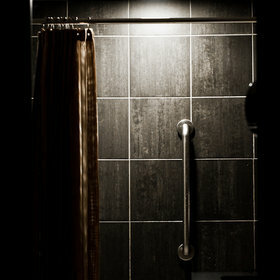 When in use, SCP-1978 emits water flow at a rate of 143 mL/s, and a temperature of 37.78° C. The temperature and water flow cannot be modified, the only control is the lever starting water flowing through the shower head. Human subjects utilizing SCP-1978's intended functions report that the water flow is more rapid than is usually comfortable, and, depending on the subject's background and mental capacity for feeling guilt, report a sense of relief, typically using the phrase "a weight off my shoulders." SCP-1978 removes the feeling of guilt over a single act of violence from the subject, as well as removing any and all evidences of such guilt. This is corroborated by examinations and comparisons of local and off-site personnel records, which invariably show discrepancies, especially in regards to commission of violence. The most prevalent discrepancy is the length of the subject's criminal record: the copy kept locally will be incomplete when compared to the master records held at Site-█, or the backup at Site-██. Testing reveals that this effect extends beyond just a change in attitude, or an alteration of official documentation; when asked about discrepancies, subjects invariably remember only what is contained in personnel records located at Site 17. Additionally, local Personnel Standards Officers are equally unaware of the differences between on-site and remote records, and assume the off-site records are in error. These same attitudes and beliefs are held by all staff or other human subjects local to Site-17. Further investigation into the effect reveals that if the D-class personnel were incarcerated for an act committed within a 1750 km radius, all products, victims, and evidences of the offense cease to exist, unless they were previously transported outside of the effective area. If, however, evidence, records, and witnesses were outside the effective area at the time of the object's activation, they will retain their contents and existence upon entering the effective area after the object is deactivated (i.e. once the water is turned off). On occasion, testing on human subjects will result in the disappearance of the test subject itself. The exact cause is unknown, though the current leading hypothesis is that it seems to be a function of the number of times a subject uses SCP-1978, as well as the magnitude of the offenses committed by the subject. It is also possible that age plays a factor. Subjects disappearing in this manner completely vanish from records within the effective area, and no memory is extant with any human subjects that are known to have interacted with the disappeared (unless they are outside the effective area at the time of activation). SCP-1978 came to Foundation attention through M███ O█████ G█████, an individual of some influence, who informed Foundation researchers of the disappearance of his male sibling and female relation by marriage. When Mr. G█████ queried local law enforcement, they were adamant that there was no record of his relations living at the provided address. Further research found that the only record of the subjects after their move to the location housing the object was an electronic payment purchase made five years previous at the ██████ International Airport, a location exactly 1███ km from the subject's street address. Foundation research found similar circumstances for a number of previous owners; though it appears that due to a perception of high turnover, Realtor agents ceased showing the location for a period of around 8 years until Mr. G█████'s relations bought the house (this information, of course, was reconstructed based on unofficial sources and correspondences held outside of the effective area). Research further discovered that the house was originally built in the mid 1950's by a man suspected by local law enforcement to be involved in the disappearances of several young males. The presence of these records is anomalous given the known properties of SCP-1978, and may indicate that the object gained its properties at some point after the events recorded by local law enforcement. See notes following Addendum-1978-B. Given the object's ability to effect changes on records, memories, electronic data, and other usual means of correlating anecdotal evidence, it was determined at an early stage that containment procedures would include constant comparison and auditing of data concerning the activation and subsequent consequences of using SCP-1978. ANOMALOUS FINDINGS: Auditors performing the mandated data backup review for Sites -17 and -██ have found an abnormal number of data correlations. As O5 is aware, in the case of SCP-1978, record discrepancies are the norm rather than the exception when reviewing data from this object. Correlations in records between Site-17 and remote sites can indicate that the remote site is now being affected by SCP-1978's deleterious effects across a spectrum of records, data, even the existence of personnel. The Auditors have indeed discovered that when records pertaining to Site-17 and SCP-1978 are reviewed from Site-█, the expected presence of discrepancies reappear. POTENTIAL IMPACT ON CONTAINMENT: While this is an unsettling change in the object's action, containment cannot be considered breached, as the knowledge of the object and its change in function is retained within the Foundation. However, the Auditors recommend the following course of action: data regarding SCP-1978 testing must be replicated off-site to all other Foundation holdings, both in and out of the object's effective area.